A little while ago I reported in the "postman brought me" thread I had purchased and received a 3Racing FGX EVO 2018 kit. While I still have a few other projects in the queue, I thought I would knock out a short build thread showing some details and reporting some impressions of the build experience. I know from my own searching there are other people on other sites who have done some builds and impressions of their own; the short story is the wheelbase is a little too long for certain racing rules and the weight is possibly +200 or +250 grams over a regular pan-style build, disqualifying it or putting it at a disadvantage from a racing perspective. With that said, I didn't buy the kit to race it. I've built a few Tamiya pan-style chassis and appreciate their lightness and simplicity, but I've also been eyeballing 3Racing's F1 chassis kits for a number of years including the F109, F113, and the original FGX. The F113 in particular caught my attention with all the carbon fiber, pink aluminum, and oil damper front suspension, but the kit went out of production by the time I got more serious about it. Somehow, too, I knew of the original FGX with its inboard independent suspension setup, but I ignored it and it went out of production too. 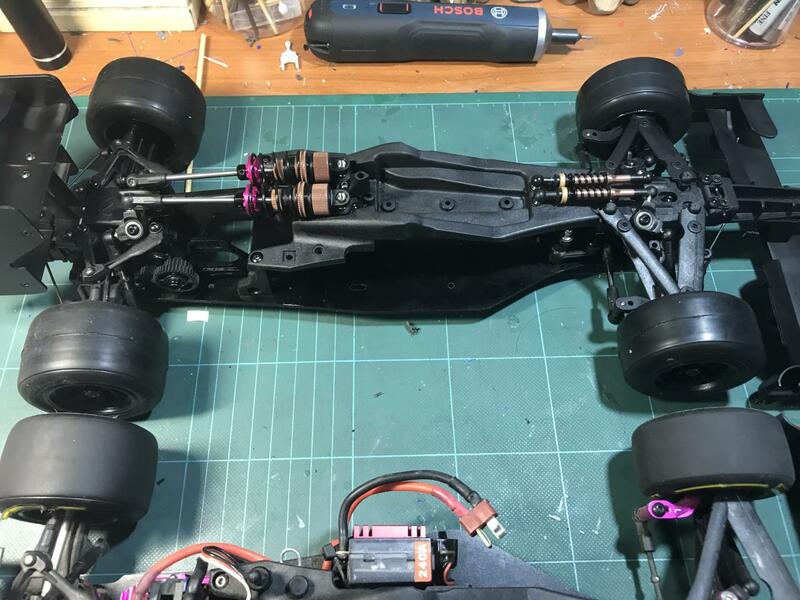 When 3Racing announced the FGX EVO 2018 last year, I committed to buying one and finally getting a F1-style chassis with independent suspension. My real focus is on the suspension of this model and how it copes with unprepared street pavement. I've had a bit of a love/hate relationship with 3Racing over the years. A decade ago I put a set of their buggy dampers on a DF03 Dark Impact, and the shock shafts bent easily. On the other hand, I've used a number of their dampers on M, TT, and TB chassis, and I've been satisfied with them. I built a Sakura D3 drift chassis several years ago and had to immediately spend an extra 50% fixing the known issues of the chassis, and later I had to hack the chassis tub to fit a battery into it. But, I also built a Sakura D4 drift chassis and I can definitely say it is much improved over the D3. So in reading others' experiences with the FGX EVO 2018 so far, I don't have any problem with the wheelbase or extra weight. The one issue that might bite me at some point is possibly a weak front suspension block. It seems a few racers have tapped the wall and the front block has broken, leaving one side of the front suspension dangling. We'll take a closer look at this when I get to that point in the build. In some respects you could say 3Racing's experience designing a carbon chassis for the F201 likely led to their own development of the original FGX and now the FGX EVO 2018. Tamiya hasn't re-released the F201, so to get a quick easy taste of this architecture the FGX EVO 2018 will do for only $110 USD at RCMart. You can see the similarities between the F201 and the FGX/FGX EVO 2018 in one of pininy's showroom entries from 2018. The EVO is like a F201, just 2WD instead of 4WD. 3Racing is offering the kit in four versions currently; the only difference between them is the color of the included body (red, green, blue, clear). Normally I would go for a clear body and paint it to my preferences, but I'm leaning towards using this chassis for something other than F1 later. A prepainted body accelerates the build and keeps it simple with just chassis and electronics; later I'll shelve the body and reuse the chassis. Here's the box. And here are the parts bags in the box. Diff, chassis, steering, suspension, dampers, wings, tires, and detail parts are all included. The bagging and bag labeling are all typical 3Racing. The decal sheet is generic but just fine for a budget build. The manual is done in 3Racing's usual style, but I was a little surprised to see them use a short binder strap to hold the pages together. It's almost like they ran the manual through a photocopier and hole punch, then went to the local office supply store and stocked up on straps. On one hand the pages come apart easily if you want to lay them out one at a time; on the other hand, a stapled book seems a little more professional to me. I know, I'm showing some of my weirdness here, but the binder strap kind of bothers me! This isn't a service manual for a diesel engine or ag tractor! Their D3 and D4 manuals weren't like this! Here's the prepainted body. Overall it's pretty nice with only a few minor complaints. The side pods are installed properly, but for some reason the front of the pod section doesn't line up with the main body properly. It's not a big deal; this can be trimmed easily. The pods are joined to the main body with some sort of clear adhesive. I didn't pull on the pods that hard, but they do seem to be held in place pretty well. Overall it's not bad. The body just needs a little more work to make it nice, but no painting is required. I'll likely get into the build itself tomorrow. As mentioned earlier, the intention is to knock this out, note anything of interest along the way, maybe do a quick test drive and get some impressions, and then repurpose the chassis if I like it. You can look at this build thread as a tour of the design, materials, and assembly process more than anything else. Look forward to seeing the build, been eyeing these for awhile. I’m a sucker for scaled down engineering. Nürburgring decals are included I see. Very important. I'll be following this build as well. I've always liked the scale aspect of F1 cars, but I don't seem to be able to grasp how to set them up properly. WIth this being 3/4 of a Touring Car I might be able to get this to handle halfway decently. First up is the rear gear diff. Its design is similar to others. The instructions show five steps for assembly, but really the manual is organized by major sections with substeps listed in each section. Whereas Tamiya might publish 30-35 steps for a typical car build, 3Racing has about 10 steps, but there is more happening per step. The texture of the plastic gears and diff cases suggest they are fiber reinfoced, and indeed, under magnification this seems even more true. Over the past few years I've been building more gear diffs, and the first few tended to leak at the diff case gasket. What I found was the very screws meant to hold the two halves together also tended to distort the case material and create some raised edges around the holes. It seemed then that the screw was sabotaging itself and creating potential leak paths where the gasket didn't completely seat against the diff case. I started pre-threading the screws into the diff case early to force this deformation; then I would sand the face of the diff to knock down these edges and hopefully create a better sealing surface. It's hard to see in this photo due to lighting, but to the right and bottom of the screw hole you might notice some shadowing. This is some of the deformation I'm talking about. I didn't sand the case aggressively, but you can see the shadow is gone from the screw hole. Also, you can see there are low spots in the molding, not just the ejector pin hole from the mold. I could sand this some more, but I don't want to get too carried away and sand one side more than another. I'll show you how I deal with it in a later photo. I put a drop of diff oil on each O-ring and outdrive shaft; I suppose I did it out of habit because I also do it for shock shafts and O-rings to reduce the risk of cutting the O-ring on threads during installation. A wet installation is a little easier than a dry installation, and we know there is guaranteed lubrication between the shaft and O-ring this way. After installing the outdrive and O-ring, dropping the shim in place and sliding the pin in from the side was easy for the top case thanks to being shallow. The bottom case was more difficult. Dropping the shim in was no issue, but the cross pin couldn't approach the outdrive's hole directly because there is a big angled surface in the bottom case. The pin was probably at a 10-15 degree angle relative to the axis of the hole, and there was virtually no give in the hole to let the pin in. So, I had to use an Xacto blade to carve out some material and then add a small dose of persuasion to get the pin installed. From there it was smooth sailing dropping the big bevel gears in place and installing the spider gears and shims. The instructions suggest filling the lower diff case to the top of the cross, spinning the gears slowly to clear air bubbles, and confirm the fluid level before closing the diff. I used the supplied 2000 cst oil; there wasn't any reason to use something different. OK, so this is what I've been doing with gear diffs lately. Beyond installing the screws early and sanding the lower diff case, I've also been applying a small amount of black RTV gasket maker on the case halves before installing the gasket. This acts like filler material for any place the fiber gasket doesn't work. Once I started doing this I've not had any gear diffs leak at all. And here we have one finished gear diff! The last part of the diff build is installing two large ball bearings. Since the FGX's drivetain uses so many gears, I thought I would clean out the grease and replace it with a few drops of oil to reduce a little drag at speed. By no means am I suggesting this has to be done; in fact, it tends to increase maintenance on regular runners. I just like the idea of loosening the drivetrain as much as possible. For cleaning out the grease I have a bearing shaker with internal screen. CRC cleaner works well; other cleaners can be used as well. After dumping the bearings and drying them with hairdryer, I spun and graded each one to decide how to use them. The smoothest, longest spinning bearings will be used in the drivetrain. The mid-grade bearings will see duty in the axle stubs. The lowest grade will end up in the steering rack and suspension bellcranks. Some of the best bearings would spin for 5-10 seconds on their own after an initial flick. That's pretty impressive given how little mass is in the bearing race itself. Clean bearings are great, but they have to be protected. I've had this bottle of oil forever. Just a drop or two per bearing is all it takes; I spin each bearing again to make sure the oil coats the races. OK, here is the finished diff (for real this time!). At this time I don't have any complaints about the gear diff other than the cross pin installation in the lower diff case. The diff itself seems to function smoothly. Fantastic attention to detail on a build that is full of them. That is a good point about the FGX being much like the F201, but with proper 2WD. I will enjoy reading this one! Bag 2 is for the rear lower suspension arms, motor mount, gears, and bulkheads. We start to build on the lower chassis plate, which is 2.6 mm FRP. The lower suspension arms are pretty solid and seem to use the same fiber reinforced material as the gear diff and bulkheads. The set screws are used for setting suspension droop, and the ball connectors are for a rear stabilizer and the rear inboard suspension. One thing I do like about the ball connectors is they use a 2 mm hex driver to install. This is a little easier to control than a box wrench, and combined with the drilled ball cups it means you almost never have to pop a cup off the ball, reducing stretching and slop over time. Installation was easy; the holes accepted the fasteners without a fight and it was easy to tell when they were fully inserted. No risk of stripping the holes. The rear suspension arms rotate on hinge pins, and these pins insert directly into the lower bulkheads and a rear 3 degree mount. The kit also includes a 2 degree mount. What I miss from 3Racing's design are the suspension balls Tamiya normally includes in their TA/TB/TRF kits; these allow you to set rear toe without stretching the holes in the suspension mounts. In this kit you just insert the hinge pins and kind of bend things into position for the FRP plate. The pins are certainly captured and have no slop to them, but I would think if you're experimenting with 2 degree, 3 degree, and maybe some other mounts then the holes in the bulkheads will loosen eventually. Here's everything installed. There are two screws keeping the rear mount in place, and another four screws per bulkhead. After its initial assembly, I found the left arm was perfect with no slop, and it dropped freely under its own weight. The right arm, though, had just a touch of friction; it would not drop under its own weight. I had to remove the right bulkhead and do a little filing to get everything freed up. This is not entirely unusual; there have been many kits throughout history that have required some degree of fitting by the builder. Next up is a motor mount and rear counter gear shaft. Now the gear diff, second gear on the counter shaft, and spur/idler gear are installed. I thought it was a little weird that adjusters were used to secure the gear diff in the bulkheads; the adjusters are set to their middle values and they never will be changed since there are no belts. I suspect the bulkheads are reused from another model, possibly the FF, because 3Racing is listing a speed-tuned gear set for the FF and FGX EVO 2018 together. I also had to wonder if so many gears are really required for this model. What I came to realize is 1) the rear suspension setup means there is no room for a spur gear right near the axle, 2) a center spur gear would offset the motor too much and create an imbalance, and 3) there are packaging constraints with a F1 body that need a drivetrain to stay close to the chassis plate. In the end you get tight packaging at the expense of some extra gears. If you look at the photo below carefully, you might notice the pitch of the gears changing. The gear diff and mating counter gear are 0.8 mod. The other gear on the same shaft is 0.6 mod. The double gear, which serves as both an idler gear and the spur gear, is 0.6 mod for the idler and 48 dp for the spur. The ratio from the spur to the diff is about 2.7:1. 3Racing mentions something about this in their literature; they advertise the idea that each gear is optimized depending on where it is in the chain of gears. The torque load is the lowest closest to the motor and the highest at the diff, so you'll see the pitch of the gear teeth increase and the width of the gear increase as you move closer to the diff. As far as dry gears go, these are little noisy since they all have a straight cut to them. I don't want to leave them dry, but I can't use oil or grease either, so I started looking at some of the PTFE lubes I have. I've used the red "Rock 'n' Roll" bicycle chain lube on a few builds in the past, and it works fine. Applying it is a little sloppy with the included bottle top, so when HobbyKing had their brush-on PTFE available on discount I bought a few bottles to try it out. I think I paid $8 for the big bottle of red PTFE, and maybe $1 for the small bottle of white PTFE. I brushed a bunch of the lube on and spun the gears back and forth a few times. As I finish this post I can see the liquid drying with a film left behind; the gears are definitely quieter and hopefully will wear better without attracting and holding dirt. Here we are at the end of bag 2, and I think I'm in a happy place overall. I can understand 3Racing reusing a bulkhead to save some tooling money, and I can accept the gear arrangement given the packaging constraints of a F1 body and inboard suspension setup. The hex drive ball connectors are nice, and honestly I'll likely never change the rear toe from 3 degrees to some other setting. Maybe one thing to address is adding metal droop plates under the adjustment screws so the FRP chassis doesn't get chewed up over time; these could be glued in place with some CA. I have a bunch of these plates from TT01 builds. Bag 3 is short and sweet. There's a battery stopper, front bumper, and steering rack to put together. I'm happy to say the steering rack itself has virtually no slop and works smoothly. Bag 4 is much more extensive and focuses on the front suspension. There are extra camber inserts provided for the front suspension block, extra spring spacers, and even a few plastic tools provided such as the ball cup removal tool and turnbuckle adjuster cups. I highly recommend emptying and sorting the hardware bags. There are a dozen M3x5 button head screws and only three M3x6 button head screws, but they look very similar to each other. The difference in measured thread length is only 0.5 mm, so it's pretty difficult to tell them apart in a pile. Also, there are 4 mm and 4.8 mm ball connectors thrown together; and for the 4.8 mm ball connectors there are 5 mm, 7 mm, and 9 mm thread lengths. Sorting everything will help with avoiding errors later. The lower front suspension arms include FRP stiffeners. The manual instructs the builder to cut the tops of the ball cups molded into the arms; this provides access to the ball connector on the suspension block. I just used a 3 mm drill. End result. It all went together easily. The balls for the kingpins were installed from the factory; I didn't put them in. They move smoothly. Next is building the front suspension block assembly. The top and bottom blocks have a series of ridges molded into them so you can move the lower block and adjust the caster at the steering knuckles. The lower block has a set of pockets that accept inserts establishing the front camber; the kit includes metal inserts you can flip for either 1 degree or 2 degrees of camber. One of the sprues also provides a full set of plastic inserts to set anywhere from 0 to 3 degrees of front camber. There aren't any options to adjust camber gain / roll center other than spacers under the ball connectors or longer kingpins / spacers at the steering knuckles. Ultimately the front suspension starts with no spacers under the ball connectors and the arms parallel to each other, so a longer kingpin might be the main way to get some camber gain. I thought it would be worthwhile to play closer attention to the lower suspension block; this seems to be the part that failed for a few racers who said they just lightly tapped the wall. One thing to note is the outer wall thickness around the pockets is relatively thin, and the transitions between the wall radii and the flat parts of the block are sharp edges. This could lead to some stress concentration. It also doesn't help that this part uses the same fiber-reinforced plastic, which means the part tends to be stiff but also potentially brittle at the same time. Also noteworthy is how tight the inserts are in the pockets. I had to use a flat surface to press the inserts in partially, and then use the ball connectors to draw them in the rest of the way. You can just imagine those outer pocket walls stretching with stress, especially at the bottom of the pocket as the insert is drawn in more deeply. The design definitely keeps the ball connectors solidly positioned relative to the block, but it seems to stress the thin plastic inherently. What's the solution? You could make the metal inserts slightly smaller at the risk of making them too loose. Another thought is to make the outer pocket walls thicker and include some fillets to smooth the edge transitions; that's a tooling change. I think possibly the best short-term solution is for the builder to avoid the temptation of the metal inserts and use the plastic inserts provided on the sprue. Then break out a file and slowly remove material until the insert is a slightly snug fit but not a tight fit. After settling on a particular setting, epoxy the plastic inserts in place. You can kind of see it in the previous photo, but while inspecting the block I noticed milling machine marks in the mold. Would Tamiya let this pass? Then again, does it really matter? Here's the assembled front block installed on the upper deck. The upper front arms get FRP stiffeners as well. I saw Exotek Racing offered triangular stiffeners for the original FGX, which didn't provide IFS by default. If you installed the IFS option on the FGX then the third leg of the stiffener has to be left off. In the FGX EVO 2018 there's no room for the third leg because IFS is the standard setup. Finished upper arms. I use a 3 mm drill again to relieve the ball cups. So, the missing IFS rocker... I immediately placed an order to get another set of rocker arms, but it will likely take 10 days to get them. I didn't want to put this build on pause for 10 days, so I took a few measurements of the one rocker arm I do have and set about making a set as a stopgap measure for now. The front pushrods have a plastic sleeve over the threaded rod. The manual doesn't specify any length measurements, so I assume the plastic sleeve is the reference. The two finished rods were within 0.1 mm of each other. Time to build the front shocks. The plastic plungers need to be filed slightly where they are clipped from the sprue, otherwise they snag just a little on the shock bodies. The manual specs 10,000 cst oil as the damping fluid; I just used silicone grease as it will stay in place and not leak like oil does. When I was doing my RM01 Lancia Stratos build, I found during my test drives that there was a huge difference between silicone grease and anti-wear grease in friction dampers like these. The silicone grease worked much better over street/driveway pavement. Dampers and pushrods installed. I burned a lot of time on this step because the 4 mm ball connections seemed to have some friction in them. I had drilled the cups when the manual didn't specify to do it, so I was worried about shavings or scrap causing the cups to bind on the balls. I took everything apart, inspected, drilled some more, inspected, tested, etc. etc. until I just gave in and decided to let it go. The suspension works just fine. Time to build the knuckle assemblies and install them with the front upper arms. The front knuckles are much like the F103GT's knuckles. M-chassis axle stubs ride in bearings that are pressed into the plastic knuckles. Pins, spacers, and e-clips contain the knuckles between the arms. It was during this step I started imagining this chassis as a long-wheelbase F103GT instead of a 2WD F201. So when I printed my rocker arms earlier I thought I would be clever and thicken the wall around the ball bearings. Turns out this was a bad idea as the larger size interfered with the back of the top suspension arms. I had to remove and replace those rockers with parts designed more like the original part. Front view of the finished suspension. The last little bit of bag 4 was used to install the top deck to the lower chassis plate and install the steering turnbuckles. When holding the chassis plate down and cycling the front suspension I can see a little bit of side-to-side movement in the top deck; there's just a bit of flex which makes sense as the top deck is secured to the chassis plate via three screws in a single line up front. We'll have to see if that flex is good or detrimental later. While the rear gears and the front steering rack seem pretty good, I'm not 100% satisfied with the front suspension. I'm a little worried about that main suspension block still, and the ball/cup connections vary in looseness for the suspension arm moldings. One lower arm in particular moves forwards and backwards by a millimeter at the steering knuckle, which affects caster. The other three arms are pretty reasonable. The ball/cup connections for the pushrods and dampers are not perfect, but the tightness is minor compared to the overall forces at play in the suspension. It's not "perfect," but pretty acceptable overall. Looks like the rear end of the car is next. It is looking great! The FGX EVO is such an interesting chassis, and while it is not perfect, it looks to build up well. Your build thread highlights the points of interest quite well. The rear upper bulkhead, rear suspension rockers, and chassis brace are first. The chassis brace is simply a turnbuckle, ball cups, and ball connectors. It all went together easily, but I suggest checking the length of the chassis brace turnbuckle before installing it on the ball connectors. The manual recommends a 25.4 mm length from cup to cup along the shaft, but when I gently placed the cups over the ball connectors I found only one cup was correctly seated at a time. I had to shorten the turnbuckle to 25.0 mm length to feel both cups resting on the ball connectors at the same time. Then I popped the brace on. Next were the rear upper suspension arms, upper suspension links, rear suspension links, rear uprights, and CVDs. The arms, links, and uprights all went together smoothly. The CVDs were pre-built, but I took them apart to inspect the cross pins. In my experience, cross pins without flats tend to find their way out of CVDs even if the set screw is tightened and locked into place. These didn't have any flats, of course. Also, only one set screw had some thread lock on it. A quick visit to the garage and some rough Dremel work, and we're good to go. I took this opportunity to rub both ends of the swing arms, the joint, and the cross pin in graphite to provide some dry lubrication. I also used fresh blue Loctite on the set screws putting it all back together. This little bit of extra prep should pay off with no surprises while driving the car in the street. Upper arms and uprights installed. There is an outer hinge pin for each suspension arm and upright; it's captured with a set screw in the upright. When I was threading the set screws into place and checking how they capture the hinge pin, I was disappointed to see the set screw barely makes contact with the groove cut into the pin. It seems like the designers are relying on the set screw to deform the plastic in the area of the groove to capture the pin. Even with the set screw installed and centered in the upright, the hinge pin still has some fore-aft movement when checking it with the tip of a hex driver. It's not quite as trustworthy as Tamiya's method of grinding a flat in the hinge pin and running the set screw directly into the flat. I don't think this will fall apart while driving; it's just not as secure. Turnbuckles and CVDs installed... I have the droop screws backed out at the moment, so the suspension travel is limited by the CVDs making contact with the lower suspension arms (although the dampers pull the arms up later). There's a front stabilizer bar and some rear dampers to install. The front stabilizer is a fairly standard design with various ball cups, mounts, and set screws. Stabilizer installed. Things are looking a little busy with two links per suspension arm, a damper link per side, a steering turnbuckle per side, and now stabilizer links! The rear dampers are a standard design with the exception of long shafts. Note the shock bodies are plastic, not aluminum, but are threaded providing fine adjustment of ride height. Finished dampers. The lower collars on the shafts are positioned 14 mm away from the bottom of the shock bodies per the manual and hold their position thanks to set screws. There are no flats ground into the shafts, so you have to use a scale or calipers to set the distance with one hand and tighten the set screw with another hand at the same time. These feel as smooth as any other 3Racing damper I've used. That's the end of bag 6. Two more for the chassis, then one for body parts. 1) It definitely is a cool design with the inboard suspension setup. I keep pressing on the suspension arms and watching the linkages and dampers operate. While the rear suspension seems softly sprung at the wheels, the front suspension seems relatively stiff. I have some optional springs on order to try them out, and there is room to add spacers on the rocker arms to change the leverage. 2) It definitely is a heavier design. If I was building a pure pan car I would expect a certain weight at this time in the build; however, I can tell this chassis is heavier already. There's simply more complexity and content to the build, as you can see above. 3) The wheelbase is 280 mm per my ruler. Something to keep in mind if you plan to race F1 at a track with it. 4) I think 3Racing should invest in at least one other grade of plastic to make certain parts. Fiber-reinforced plastics work well for many of the structural and drivetrain parts, but I think something a little softer makes sense for the ball cups. 5) Certain design and manufacturing revisions could be made to make this better. The front suspension block with the tight insert fit, the rear hinge pin / set screw interface, and all four of the front suspension arms (ball cup tolerance) would benefit from some changes. This isn't the first 3Racing kit I've had where one of the suspension arms is more sloppy than the others; my Sakura D4 also has front suspension arms with molded-in ball cups, and one arm was worse than the other. Replacement parts acted exactly the same way. It's almost like it's a molding issue depending on where the part is on the sprue. 6) For a design that has so many ball connectors, using a hex driver to install them and having access holes in the ball cups is a nice feature to reduce stressing the cups. 7) All the ball bearings were good, and the turnbuckles were good too. Always liked FGX, maybe for its seemigly unecessary complexity. 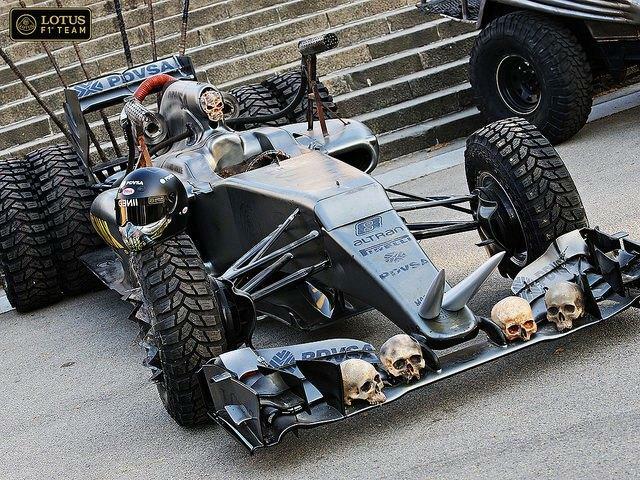 Makes me wondering, why Tamiya didn't come with something similar, since overengineered cars are Tamiya's thing. Or atleast independend suspension RWD touring. Excellent build as always. That's an interesting chassis, I like the really scale features of the suspension with all the rockers and push links, will be interesting to hear how well it runs. Have to say the dremal to the cvd pins is inspired, wish I'd thought of that. So, bag 7 is all about wings and a rear stabilizer. The front wing has a few winglets, a stiffener, and mounting nose. The rear wing has several surfaces, a mount, and a center brace. The mount has space inside for a LED. Front and rear wings installed. Bag 8 includes the tires as well as hardware for mounting the electronics. Looks pretty good with all the design details. Dropping each end of the chassis and letting the suspension settle, I noticed the rear was pretty good. It was reasonably damped and only cycled once. The front, on the other hand, was very bouncy. Dropping the front end, I could see the chassis bounce a half dozen times. The front springs seem hard (softer ones are coming), the silicone grease isn't dampening very much, and the front tires seem harder than the rear tires. I think I would be tempted to get a second set of rear dampers and mount them up front so I could use more common springs and work with a variety of oils. I guess I really need to drive it to decide for certain what to do. When I installed the body I noticed the rear springs were rubbing against it, and the body was a little warped. Body clips will keep the body straight on the posts, but I think it might be necessary to slot both sides of the center tunnel so the springs and damper bodies aren't touching the body. I’d probably give it a bit of a drive before fiddling further with the front end. The F201 has surprisingly firm front end too, mainly down to the frp plate under the front arms. So good that I've ordered an FGX! I’m a sucker for scaled down engineering. SWB, what do you think of the Team Associated RC10F6 Factory Team's F1 ? To be honest, I don't have an educated opinion. The RC10F6, Team CRC WTF1, and Tamiya F104V2 all have similar rear pods, ball diffs, pivot ball link rear suspensions, battery placement, and servo mounting. The front suspensions vary in design somewhat, but they all use kingpins/springs at the knuckles. These are all targeted towards the racing crowd with the materials, designs, and prices attached to them. I tend to like Team CRC for indoor onroad racing class pan cars because they sell the carpet a lot of tracks use, design and manufacture the cars to work on that carpet, have well-publicized wins, and have some fun names for their stuff like Carpet Knife, Battle Axe, and WTF1. They've been around for awhile and are fairly old-school. At the same time, I do like Tamiya's F1 and Le Mans releases for the historic body shells. Lotus 79, WR1, 312T3, P34, R91CP, 787B, etc. all satisfy that "models suitable for radio control" tag line of Tamiya's. I wish they would bring back more bodies from the earliest part of their catalog. I need an early March shell to make a 2-4-0 companion to the P34. While Tamiya covers scale bodies, at the moment 3Racing has this nice scale chassis. It may not be competitive or legal per certain rules, but as @Juls1 said, I'm a sucker for scale engineering as well. Even with a few detours in the build, I'm completely satisfied with the $110 USD price tag and build result. It's just too cool to pass up! I just finished binge-watching the "F1: Drive to Survive" series on Netflix, and I thought it was pretty good. There was almost no coverage of Ferrari or Mercedes, but Red Bull, Renault, Haas, Force, Williams, and Sauber had a fair amount of content. The blend of qualifying and race highlights with team and driver stories and race preparation was pretty good. By the end of the series I had a much better appreciation for the personalities and stories presented. Check it out if you subscribe to the service. 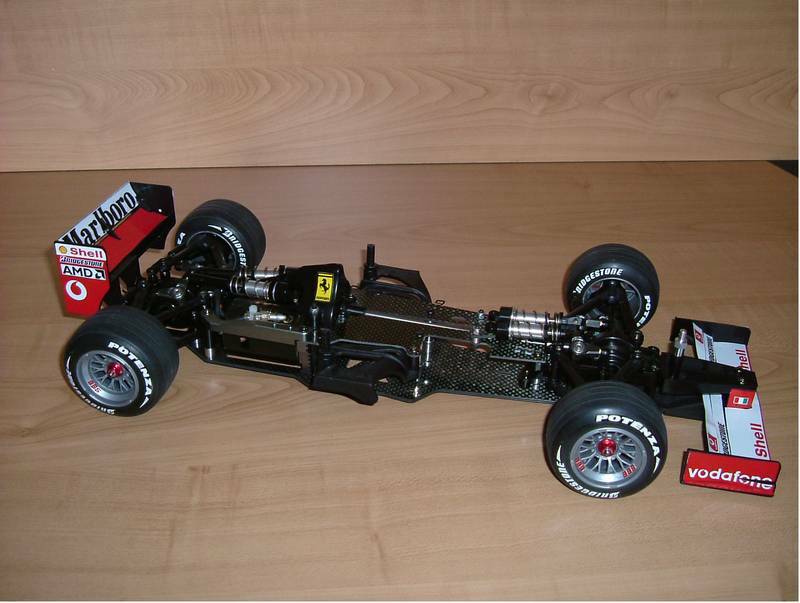 the chassis looks great, I like the TRG F1 also, seems hard to be found. I've been playing with the body a little bit. A day or two ago I worked on trimming some sections so the rear dampers won't rub on the body anymore. Today I trimmed some of the mismatched edges and sanded all of them. Looking at the manual some more, the instructions call for using clear servo tape to mount the pods to the main shell. What the factory actually did, though, was disregard those instructions and use glue instead. This is why the pods were misaligned with the main body near the front suspension. Modern-day Lotus 79 tribute to place next to my F104W Lotus 79. So we'll see; I'll latch onto something soon for a theme. With the matt paint and cutaways revealing the springs, it is already looking a bit Mad Max-ish, so why not go all the way with it? Wow,,, impressive looking kit Paul! Surprised it does not cost more money given the level of content and features. I've been away for a bit on the forums- its been hard to keep up! How did you get the matt black finish - looks badass!!! It bonds to the polycarbonate and stays flexible since it is meant for automotive interior surfaces. Full credit to @Yello for bringing this up years ago. Baaaaaah Doesnt seem to be available in the uk. Halfords have what seems to be something similar might experiment with that.